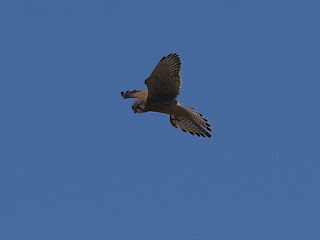 The female Kestrel on Buck Hill is giving a splendid show, though her mate is seen less often. 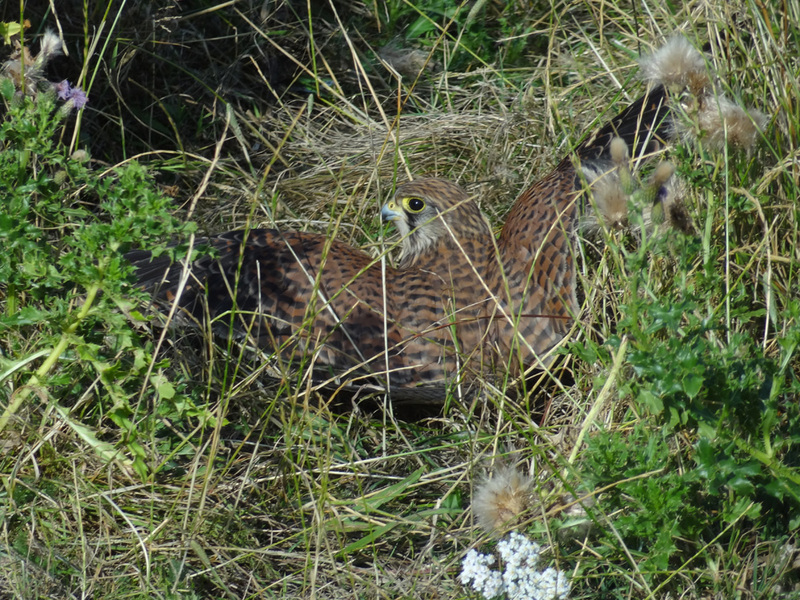 Julia was watching her yesterday flying out from the trees on the top of the hill, and also keeping a lookout from a bench in the long grass. 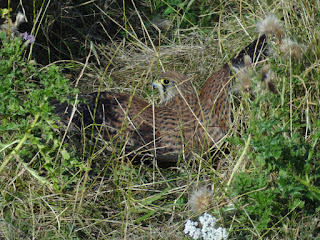 The Kestrel got used to her, and came quite close. When I went to Buck Hill this morning, the Kestrel was perching in several trees along the top path. She balanced easily on a swaying branch, then took off. 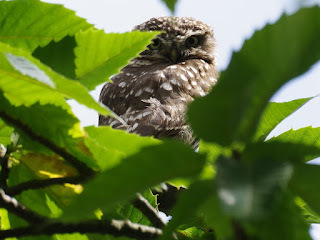 A second later she landed practically on my feet, realised her mistake, and sped away before I could get a photograph. This picture is of her about ten feet away. She is quite calm about people if they stay still. She ranged widely over the hill, hovering to get a good view. I think she was eating mainly larger insects such as moths and grasshoppers. 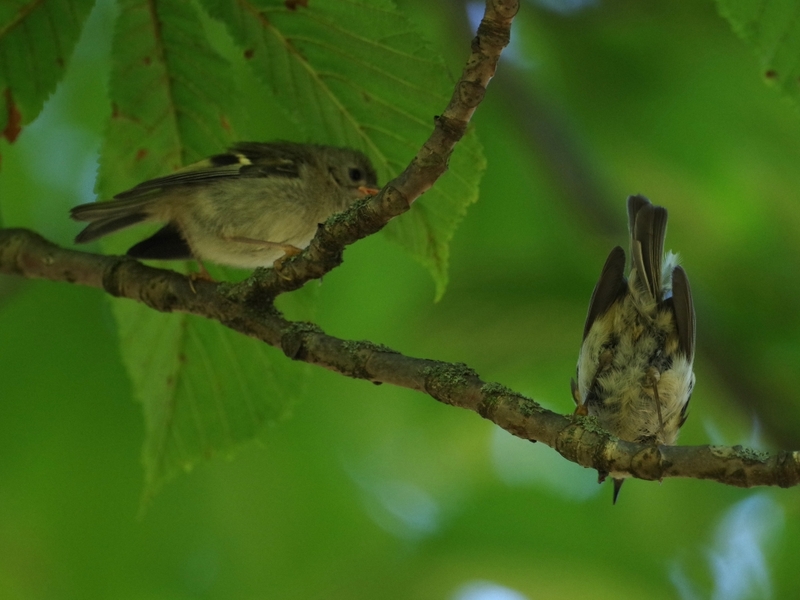 Two young Goldcrests were chasing a parent around a horse chestnut tree near Queen's Gate. This pucture shows one of the young ones on the left, and the parent on the right. Probably the attraction of this tree is leaf miner moth caterpillars. You can see the damage they have done to the leaves, though this tree is less affected than some. The male Little Owl near the leaf yard was hiding in the leaves again. The largest family of thirteen Tufted ducklings is still intact, but I could only get a maximum of twelve of them on the surface at once in this video. A Herring Gull passed over this Tufted Duck family several times. You can see how effectively the ducklings can dive to avoid it. 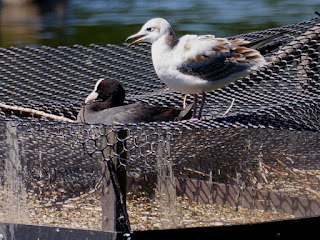 A Coot can be heard shouting at the gull. The gull appearing later in the video was a smaller Black-Headed Gull, and not dangerous. It only caused a moment of panic. I think this Canada Goose with an almost white head is a pure Canada and not one of the hybrids. The rest of it is completely normal, including black feet. The hybrids have grey or dirty pink feet. There is a new Coot family with four chicks from a nest in the reed bed at the east end of the Serpentine. But the large nest at the outflow has vanished. Perhaps a pedalo ran into it. Only two twigs remain. 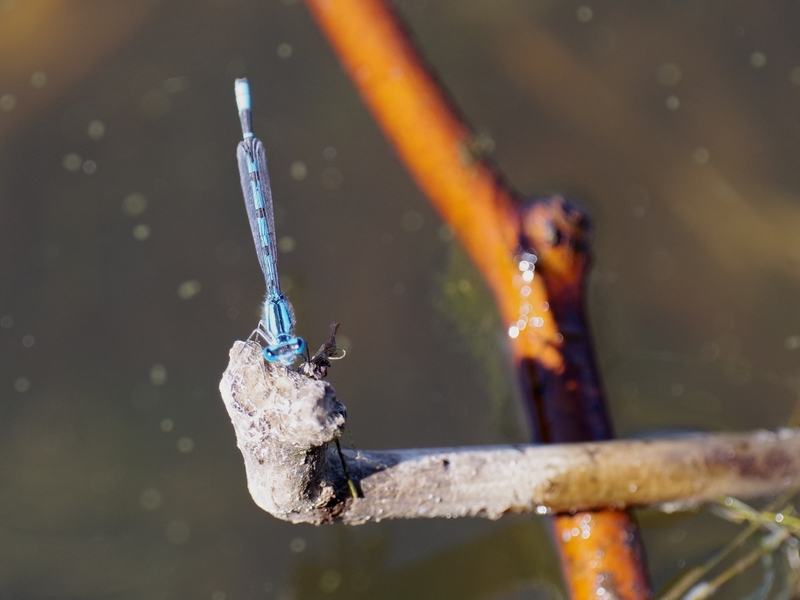 A Common Blue Damselfly perched on one of them. 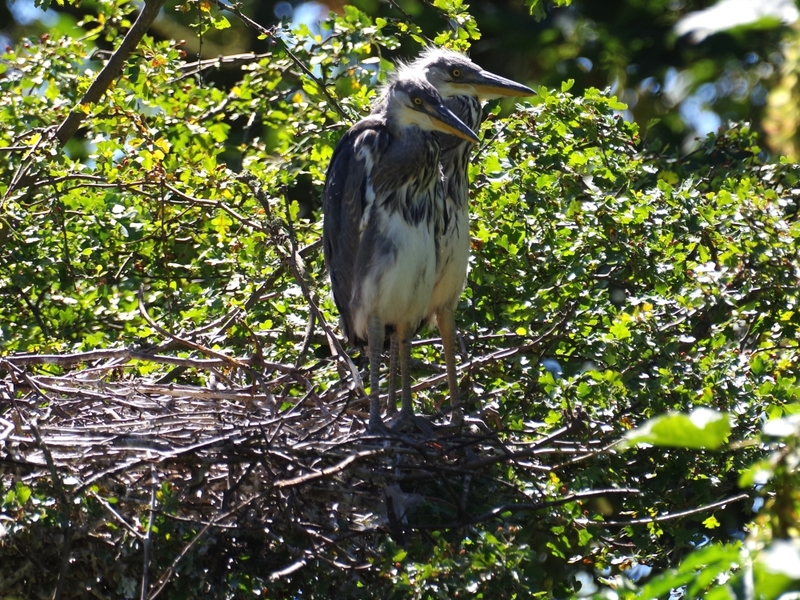 The sole surviving chick from this nest, which was washed over the weir, was calling from below. I hope its parents are still feeding it until it's large enough to climb out. It's the only chick ever to survive any length of time from a nest here. The Coot nesting on the raft was mildly annoyed by a visiting Black-Headed Gull. 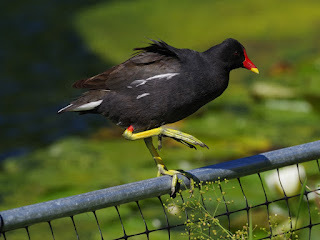 A Moorhen in the Italian Garden amused itself by walking along the top of the metal fence around a clump of plants. 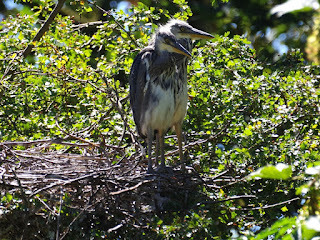 The young Grey Herons on the island are getting larger and more adult-looking every day. the white headed Canada, don’t you reckon there might be a snow goose somewhere in the mix? 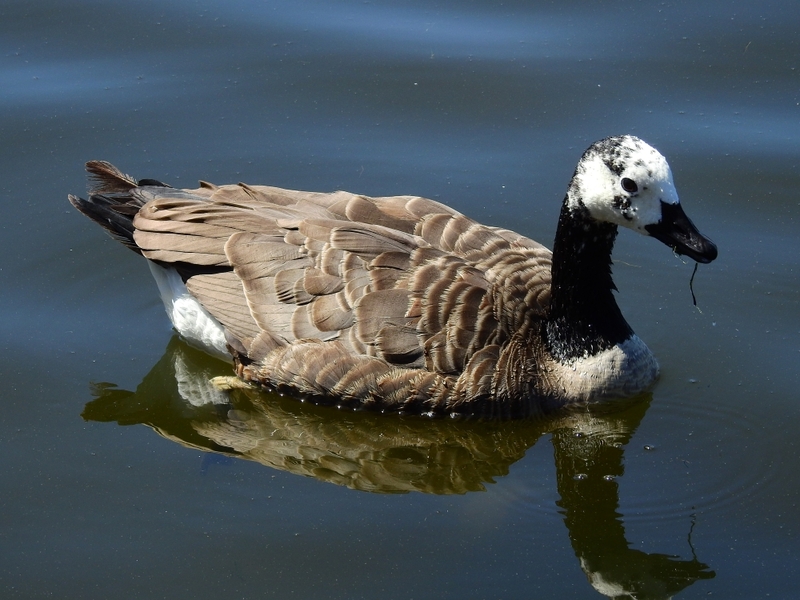 There are several Canadas with white speckled heads, of which this is the whitest. I think it's a normal bit of leucism, and not the result of cross-breeding. All the birds are normal in size and shape, and in their colour elsewhere. 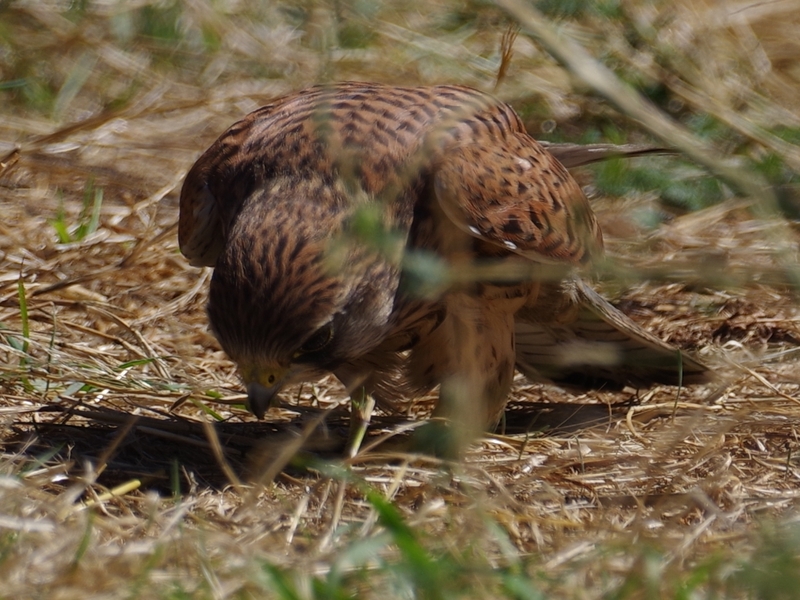 Lovely to see the Kestrel's elegant, effortless take-off so close up. and the Tufted family in action! He did indeed. Perhaps my soul just isn't that lyrical. 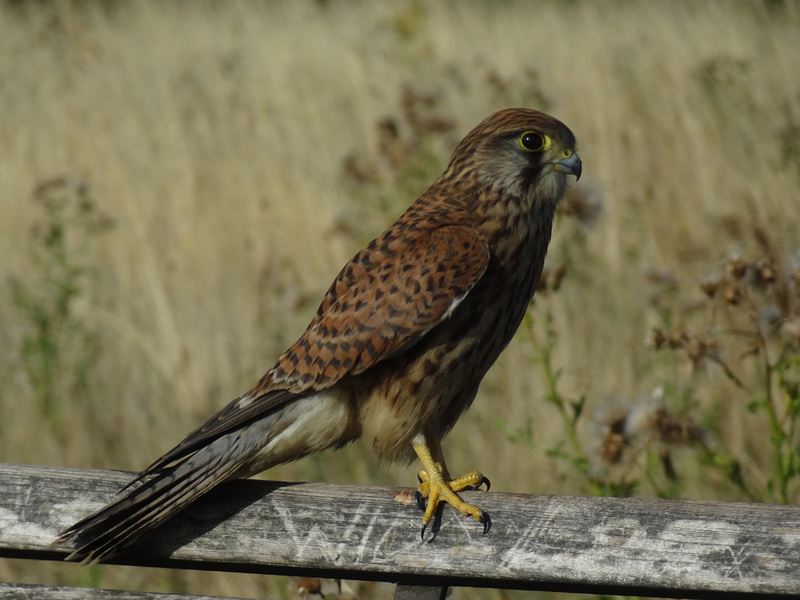 That is a particularly fine-looking Kestrel! 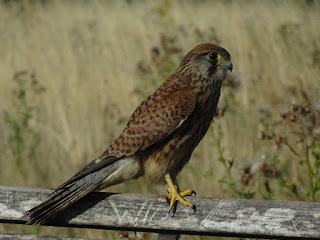 That was lucky to see such a handsome bird at such close quarters. How sad that only two twigs should remain of the Coots' impressive labour. However one species' loss is another species' win, it seems. That is the way of the world. I hope the coot parents are still feeding the chick. It's made it so far alive, against all odds. I worry that the Coot parents will be deterred by the loss of their nest and will forget the chick. 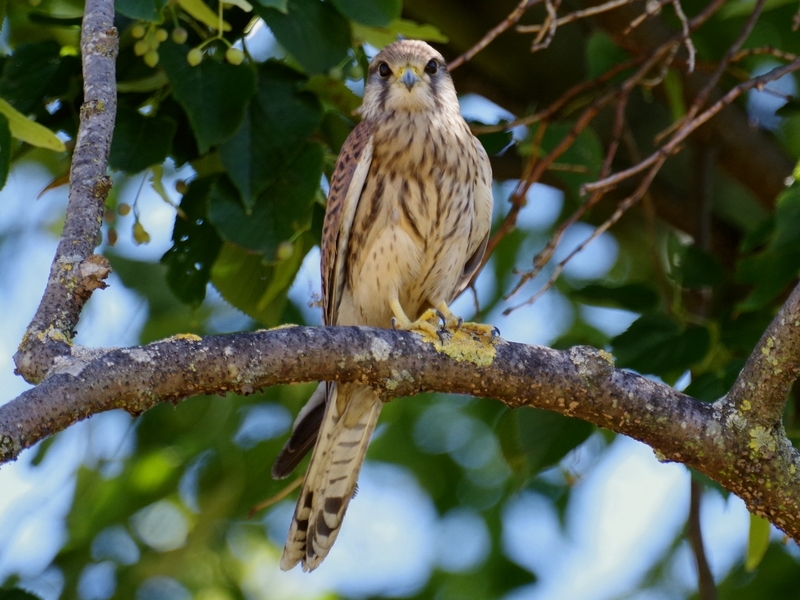 As for the beautiful Kestrel, I can say no more than repeat the link in my previous reply.